I work as Planning and Performance Manager for Adults and Communities; I have worked in adult social care for the last twenty years or so and in local government for over 34 years – you don’t get that for murder to you? At school I excelled at geography. Not, I have to say, because of any special talent on my part! My success was more attributable to an outstanding teacher, Mr Parkin, who enthused us all and made learning an enjoyable experience – not the norm for a large comprehensive school in a depressed urban area (Doncaster). As part of my ‘A’ level studies I was fortunate to go on a field trip to the Lake District staying in a boarding house in Keswick for 5 days. The trip made a huge impression on me and left me with many memories that have stayed with me, and will continue to do so for the rest of my life. I vividly recall us all descending the fell side over wet grass from Great Gable to Honister Pass. Without proper footwear we all ended up tumbling head over heels for most of the way, just like the annual ‘cheese rolling’ event that happens in the west country. Of course, in those days the dreaded risk assessment was but a twinkle in its father’s eye! These days I suspect pupils would have to be roped together and have a full team of sherpas to be allowed to do anything similar. I also recall us being ejected from a pub in Keswick for being under age. Word somehow got back to Mr Parkin (obviously one of the group who had not dared to go drinking ‘snitched’ on us) and the guilty few were duly required to assemble in the lounge of the boarding house in front of our teacher. We were anticipating a severe b******ing; one of those ‘you’ve let yourselves down, you’ve let your parents down and even worse you’ve let the school down’, speeches. Could it be worse; would we be sent home? Now, one of the students, a lad called Lloyd, was black and what Mr Parkin did was to launch into a discussion of how we might be able to accuse the pub landlord of racial discrimination – pretty radical in those days! Of course we were all appalled by this, seeing that what we had somewhat innocently done could turn into a lot of trouble. But it summed up Mr Parkin. He made his point without too much recrimination, we all felt guilty, realising we had done wrong and potentially embarrassed our teacher. We continued to have a fantastic trip and a great experience. So what has all this got to do with Kilimanjaro I hear you ask? Well, during those five days my love for the mountains was born. Growing up on a Council estate in the sixties and seventies the mountains, up to that point, had just been something you read about in books but had little, if any, chance to experience. 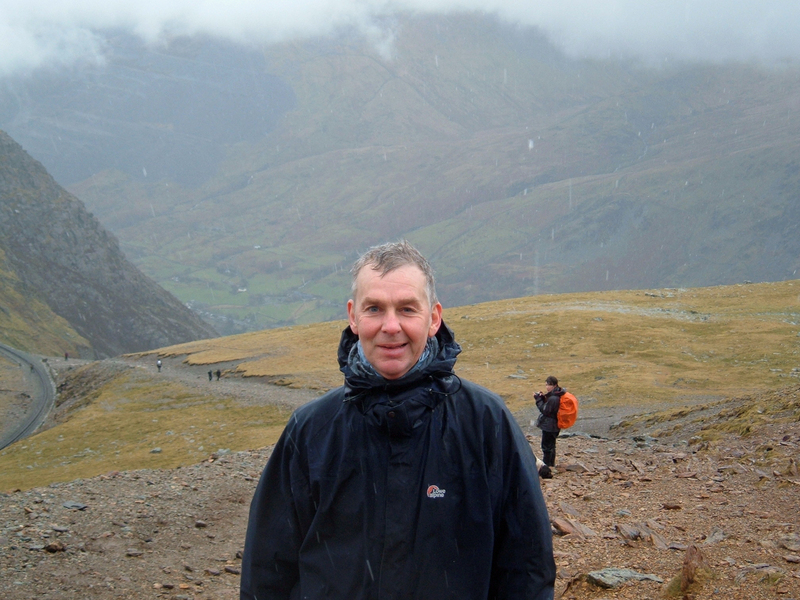 I have since been back to the Lake District and Keswick on many, many occasions and climbed most of the highest peaks. I have also tramped most of the Derbyshire Peak District, plus the Yorkshire Dales and North Yorkshire Moors. But this has never been quite enough. Throughout my life I have had a fascination for adventure and especially for extreme adventure and those brave enough to endure severe hardship to achieve their dreams – to climb the highest peak ‘because its there’; to be the first; to go the furthest. My bookshelf includes Ranulph Fiennes’ autobiography (he really is mad – he amputated his own frost-bitten fingers), Scott of the Antarctic, Touching the Void, Race to the Pole, No Way Down, etc. – you get the idea? I suppose, sadly, like many of us, I have lived my dreams through the exploits of others; from the comfort of my lounge; from the safety of a life in local government! So this is my chance. A chance to be part of a real adventure and to test myself against the forces of nature, not just to read about someone else’s trials and feats of endurance. At 53 there probably won’t be many more so I intend to give it my best shot. Whether I succeed or not remains to be seen but if I don’t, at least I will have had the experience of taking on such a substantial challenge. Like others in the team I am very apprehensive about how I will cope with the extremes of altitude, temperature and physical endurance. But that of course is also the attraction. I will be eternally grateful to Ken, Martin and Doug for setting up this expedition. To be able to indulge my love for the mountains and my thirst for adventure and to raise money for such a great cause at the same time is a fantastic opportunity for me that I never thought I would get. As you will hopefully read on this site, we are a diverse team with as many reasons for taking on this challenge as there are team members. I know from my reading of the exploits of Scott and others that both the practical and emotional support of fellow team members is one of the most potent forces for individual success on any expedition. I hope and trust that we will gel as a team and that through mutual support we can help each other to achieve our collective goal. Hope your having an awsome time dadd!!!! !